Some people like Ben Stiller, others don’t, but for the most part I think he’s a genuinely funny guy. Just like any other comedian, he’s had his downfalls – but he still picks really good movies to shine his humor in – so there’s that. 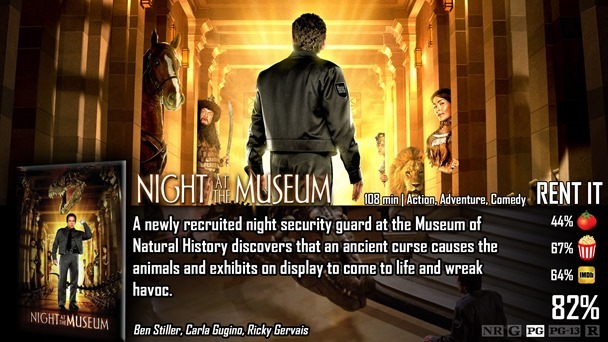 Night at the Museum is one of those movies that a lot of people are going to remember whether they are young or old because there’s a lot of good to the entire movie for several reasons. I wouldn’t necessarily call it a movie that needed two more sequels…or even one, but that’s life now and it’s something we all have to accept. This adventurous film stars Ben Stiller as Larry Daley, a down-on-his-luck type of guy with aspirations for his future. However, he moves from apartment to apartment because his plans never follow through – but he decides to get a job for his son’s sake. He needed a more stable position in life, and what he got was something unbelievable. He got the new night shift security gig for the Museum of Natural History in New York – where after the sun sets – everything comes to life. Like I said in the 3-Word Review – when it comes right down to it, this is a magical adventure through-and-through. I’m sure you’ve seen The Indian in the Cupboard, Toy Soldiers, or even Toy Story – about inanimate objects coming to life. It’s always magical and usually a really funny and an adventurous experience – and Night at the Museum took the elements of these three films and expanded it about a hundred times over – this is an entire museum. There are life-threatening aspects like Attila the Hun and bloodthirsty lions – as well as figures that inspire hope, like the late Robin Williams as Teddy Roosevelt. What’s also interesting to note is this movie has a few educational and emotional messages that drive the film. Well, the educational aspect is mostly just for fun, but you can learn a thing or two just by watching the film…which is kind of cool. The emotional side of things was the power force behind the film – and that’s ultimately what keeps you watching. You can watch Ben Stiller run away from wax figurines as much as you want, but you want to know how he’s going to be a good father to his kid and if he’ll get romantically acquainted with Rebecca, heck you even want to know what happens between Teddy and Sacajawea. Here’s my main problem, if you sit and watch the film and ask yourself what the movie is about – you’ll just end up with things that happen in the movie. “It’s about a museum where things come to life!” No, it’s actually about a father trying to do what’s best for his kid coated behind the humor and magic of a museum coming to life. That very coating is probably the reason the film got sequels – people wanted to see the magic, comedy, and characters and forgot about the main story. Movies like that do bug me, because even filmmakers can lose the point of the thing. The reason this movie works is because it has tremendous heart from the entire cast, and when given the choice between the first and second film – this is the one they’ll probably remember the most of. This movie is definitely geared for a younger audience, as a majority of the humor is actually physical humor laced with Ben Stiller’s own style of comedy – which works for the movie. Kids will definitely love it, and it even has hidden jokes that only adults will capture as well which makes this a film that all audiences can enjoy. 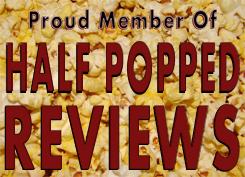 This is one of the few films that are relatively recent that anyone can enjoy. There is something for everyone in Night at the Museum – The physical humor and comedic stylings of Ben Stiller really make this film its own thing. The people who made this movie focused a lot of their energy on making a majority of the movie just, funny, and not meaningful. The main plot of the movie is actually incredibly meaningful, but is drowned out by a museum coming to life – and all the aspects that tag along with that. your opening line is perfect Dave. That’s exactly how I feel about Ben. I really enjoy what he does and he gets a bad rap more than he should. Nice writeup.